In the beautifully illustrated One to Ten, optimism is an active, thoughtful choice. 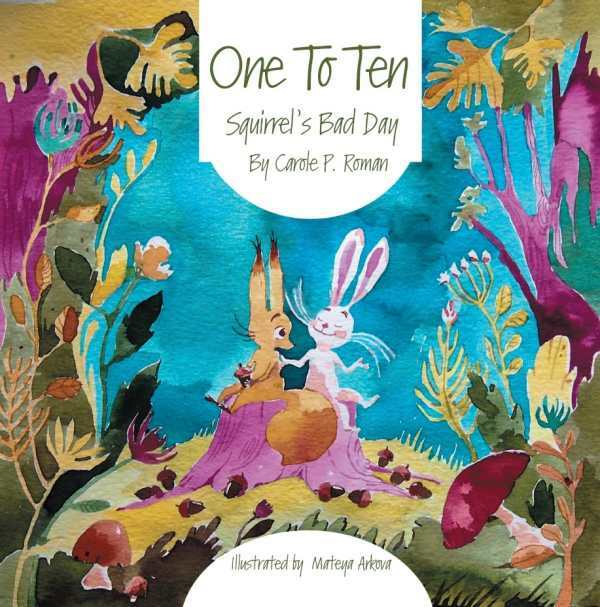 Carole P. Roman’s One to Ten: Squirrel’s Bad Day is a therapeutic tale is elevated by Bulgarian illustrator Mateya Arkova’s nostalgic style. When Squirrel drops an armful of acorns in a river, a friendly, take-charge rabbit shares his mother’s strategy for keeping problems in perspective. Rabbit asks several friends to recall past events and rate their emotional impact. Situations range from a deer’s parents’ divorce to a frog who failed a math test. Listening to his friends allows Squirrel to weigh his disappointment. A sincere plot and clear examples offer a useful coping strategy. Instead of dwelling, Squirrel learns the value of talking through issues aloud. The message, however, is delivered with an overly direct approach. Rabbit resembles a counselor more than a peer. The tone turns curiously adult, especially when conversations are moderated in lines such as “So, Squirrel, how do you feel about those acorns now?” Rabbit also places words in his friends’ mouths before they have time to respond. At one point, he comments, “I think we know what this one has to be. It doesn’t get much worse than this. Yep, it’s a ten.” This tendency to bring the focus back to himself, and to his own assessment, unintentionally diminishes the group dynamic. Still, the one-to-ten scale is a an easy way to contextualize pain. The idea that time offers relief is presented through beautiful illustrations. These include two-page spreads as well as smaller panels. Scenes alternate between the animals’ present-day gathering and memories. An exuberant palette recalls 1930s flour sack fabrics; orange, purple, greens, and blues create a forest that is at once faithful to the story and also a heightened fantasy. Wide-eyed creatures inhabit lush spaces without seeming naïve. The text—which appears in pencil-thin all caps—is difficult to read but is thoughtfully parsed in cartoon bubbles. One to Ten turns a stumble into a lesson on silver linings. Optimism becomes more than a breezy antidote; it’s an active, thoughtful choice inspired by a variety of life experiences.